Vice President Dr. Bawumia has challenged investors to constructively engage their African counterparts as the governments and peoples of the continent gear up to take their destinies in their own hands and assume their rightful places in the comity of nations. The three day Conclave, under the theme “Partners in Development, Building New Synergies,” and organised by the Confederation of Indian Industry (CII) in collaboration with the Export-Import (EXIM) Bank of India, is bringing together over 500 delegates including 33 Ministers and Heads of Government from 41 African countries. 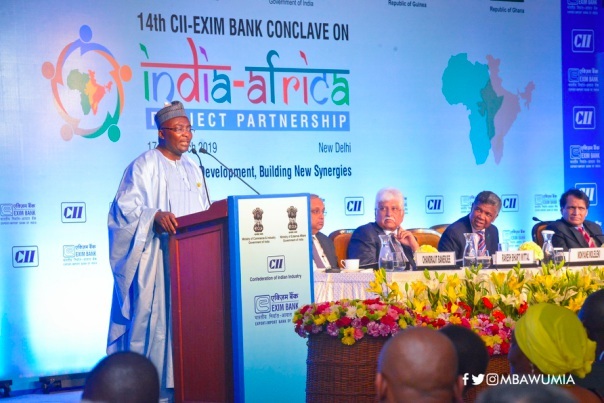 Over the past 13 editions, the CII- EXIM Bank Conclave on India Africa Project Partnership has emerged as the pioneer event for Indian and African governments and industry to meet and explore new avenues of partnerships and enables the Indian and African leadership to take stock of the progress of the partnership and address future needs. “Considering the significance of free movement of goods, services, and persons across borders to socio-economic development, the Single African Air Transport Market (SAATM), a Flagship project of the African Union Agenda 2063, was launched to create a single market for Air transport in Africa. This is to allow significant freedom of air transport in Africa.